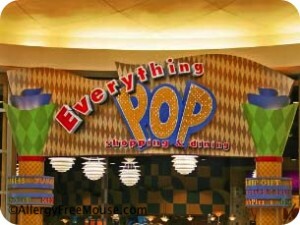 My Mom and I took my son to stay at Pop Century when he was 4-yrs-old in Aug. 2011. We were there 4 nights on the dining plan. 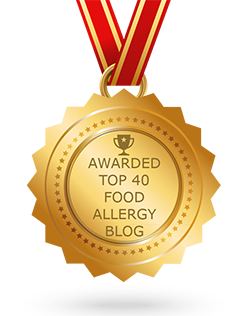 The chef called me several times before our trip to plan for my son who has over 20 allergies. Due to all of his allergies, there really isn’t much on most of the kid’s menus that he can eat safely. All the hotdogs, pizza, chicken, hamburgers, mac & cheese, pb&J are unsafe for him. My son loved watermelon, so the chef ordered a watermelon for him to have during our stay. He used 3 out of the 4 quick service and most of his snack credits there. We are not early risers most days, so I decided that the best thing to do would go by Pop dining on our way to the bus and get his lunch to go. 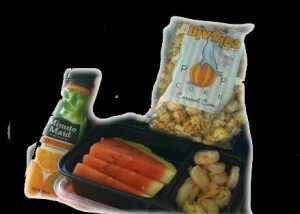 The chef prepared shrimp, watermelon, and allowed him to get Divvies popcorn as his dessert. He also got an orange juice as his drink. My son loved the Divvies popcorn so much that he choose that as most of his snack credits too. We are both sad that Divvies is no longer at WDW. I loved the plastic to-go plates the chef sent the food to-go in because they are reuseable. The chef was great to my son and he loved the food at Pop. 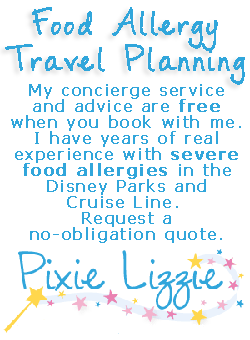 If you would like to review Everything Pop Dining or any Disney restaurant, submit a food allergy dining Quick Review.